Made out of durable plastic to last a long time. 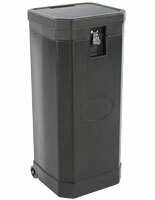 Dual handle design and built in wheels make the unit convenient to move. 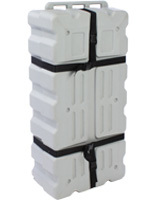 Includes buckled straps that tightly seal the unit shut. 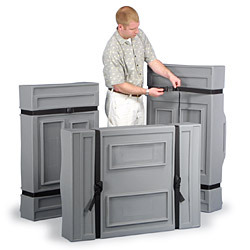 This plastic shipping case is made for packing and shipping modular exhibit panels between shows. This crate holds items 43" long by 31" wide. The design of this plastic shipping case allows it to hold anything from 8" to 14" deep. 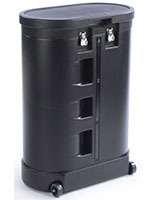 Made from virgin linear low density polyethylene this container is built to withstand the normal wear and tear that typically goes along with transporting items to and from tradeshows and conventions. 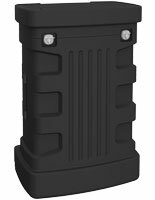 This plastic shipping case also features heavy duty wheels that make maneuvering this sizable container around effortless. There are also handles on two sides to allow for easy rolling or lifting. 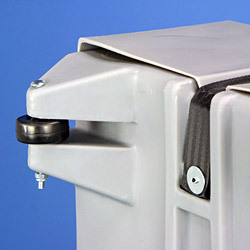 This plastic shipping case also features securing straps that are fastened to the bottom of the case, and connect to each other using quick release buckles. This transport crate is intended to store and protect relatively flat objects such as folding display panels, or portable flooring. 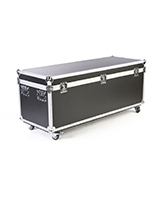 Use this plastic shipping case to protect large format graphics when not in use, or during transit from one show to another. 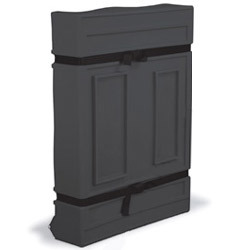 When not being used, this rugged storage crate can be placed in a warehouse or closet, and won't take up much space. 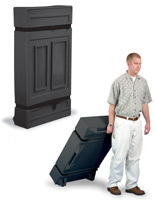 This plastic shipping case will also fit into most SUV's or the trunk of most mid-size cars. 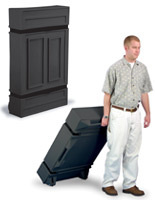 Whether you need a crate to store some valuable merchandise, or you want a container to keep all of your goods for your next tradeshow; this heavy duty crate will satisfy your needs. 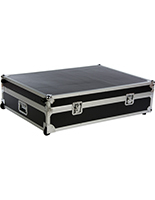 Buy this plastic shipping case today and start protecting your investment. I received this case on 6/5/15. I have sent it out to a total of 3 times. The first shipment was Ok, but prepping for the 2nd show we noticed that the one of the buckles was not properly closing (if we pulled lightly on the strap, it would just open). We fixed it the best we could and sent it out. I had a short turnaround time between the 2nd show and the 3rd and did not have time to contact anyone about the issue. When I got the case back from the third show, one half a buckle was completely missing. I called customer service, and I was told that there was nothing they could do except contact the manufacturer for a part.So, now I will have to pay for a part on this 4 month old case that has only gone out 3 times. Luckily, it is an inexpensive part. Any other part would've been hard/impossible to replace. I really expected a case designed for shipping to last longer and be more robust. Compared to the other cases we send out to trade shows this one is not very good. We're sorry for this inconvenience. You can expect to hear from one of our Customer Care representatives shortly.